They're offered in three different handsome handles; a plastic black, acacia and birchwood. 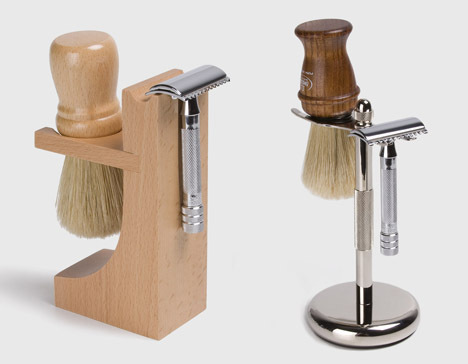 And if you own a shaving brush, you'll need the right holder. You'll find two offered at the Prospector Shop- the hardwood razor and brush stand for $18 or the chrome brush and razor stand for $32. A good razor is important. The guys at Prospector Co. were discerning in picking the right line to carry in their shop, searching for one that was superior in both design and engineering. They found it in the German company, Merkur. These are high performing razors (recently voted Razor of the Year), with a chrome plated design that work well for the novice to the seasoned pro. I love a leather pouch with accessories- this one is for the Merkur travel razor that breaks down nicely into three parts. There's something about a straight razor I can't help but love. It's old school and cool...plus, has a hint of danger. This one is made from a non stainless-steel carbon steel blade with gold etching. Its handsome handle is made from maple wood and is smooth to the touch- enhancing the quality of the blade. See the entire shop of grooming goods, here.